The widow Alice Hanmore has a bone to pick with Evangelists, or, more specifically, the College of Medical Evangelists. Truth be told, evangelists should be, oh, evangelical, and leave the application of Röntgen rays to the professionals. In March of 1926 Alice’s husband M. J. Hanmore, a Fullerton oil worker, began experiencing stomach pains and loss of appetite; Drs. 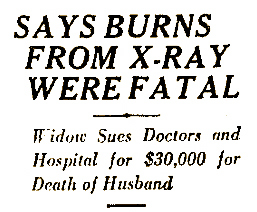 Claude E. Steen, Emerald J. Steen and John A. Whalen of the CME/White Memorial Hospital decided that an intensive course of that ever-beneficial ionizing radiation would do the trick. Today, Alice is charging in court that “negligent and unskillful” employment of X-rays resulted in severe fatal burns—she’s asking for $30,000 ($348,669 USD2007).